The city has erected several anti-drug signs at the corporation limits of Hillsboro, although this one located near Westview Motors on North High Street was later moved after the business expressed a concern about traffic safety. As he promised back in April, Mayor Drew Hastings this week had anti-drug signs erected at several city corporation limit spots in Hillsboro, although by Thursday afternoon at least one of them was being moved after it raised concerns about traffic safety. As The Times-Gazette reported in April, Hastings unveiled the signs at a drug information meeting held by Hillsboro Police Chief Todd Whited. When he presented the prototype for the signage at the April meeting, most of the 30 or so people in attendance enthusiastically expressed their approval. In fact, the phrase, “The citizens of Hillsboro warn you!” was added based on a suggestion from an audience member at the April meeting. At that meeting, Whited said that 82 drug busts were made in Hillsboro in 2010, but that number nearly doubled in 2014. In the first three months of 2015, 113 drug busts had already been conducted, said Whited. 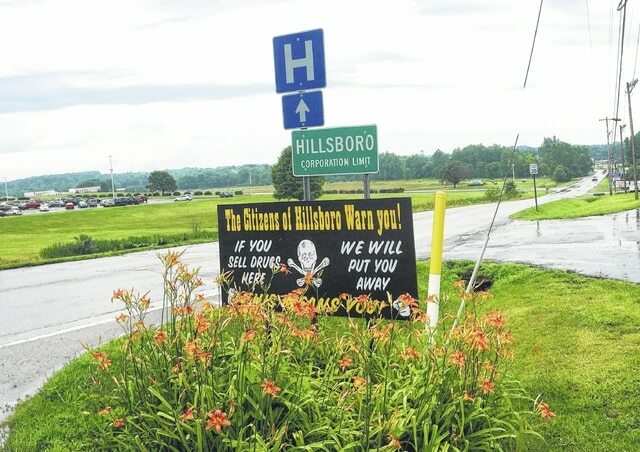 Randy Barr, Water, Sewer and Street Department superintendent in Hillsboro, said Thursday that the signs had been erected so far on U.S. 62 north, U.S. 50 east, SR 73 north and SR 124 east. The sign on U.S. 62 north, which is also North High Street, raised concerns from Westview Motors about the line of sight being blocked for customers pulling out of the business on its northern-most exit. Later Thursday, Barr and Safety and Service Director Todd Wilkin said that sign was being moved closer to the Hi-Tec Center. Westview salesman Shane Murphy said Thursday that the sign’s message was not a problem, but its location was a concern. He said Westview owner Greg Goolsby was contacting the city, and Hastings and Wilkin confirmed later that after Goolsby called, the decision was made to move the sign. “I’m talking with anyone concerned about the signs impeding sight,” said Wilkin, adding that the city was interested in working with businesses that were concerned about safety issues. But while some signs might be relocated, they will definitely stay up, said the mayor. “I told Randy to move the sign (at Westview) and make sure to do it today,” said Hastings on Thursday. Barr said the sign would be relocated near the Hi-Tec Center as soon as the city gets clearance from the Ohio Utilities Protection Service, which first must make sure that no underground utility lines will be impacted by the posts that hold the signs. Hastings has said that the drug problem in Hillsboro is responsible for a plethora of ills, and has proposed several legislative initiatives to fight the problem, including a meth house law that was eventually scrapped but which led to enforcement of the city’s existing nuisance law to condemn homes until a meth cleanup has been performed. When he unveiled the anti-drug signs in April, Hastings said that the most effective way to fight the drug problem is for the community to rise up against it. “People have to get really mad about this,” he said.